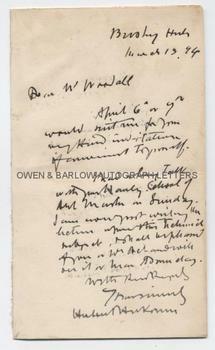 HUBERT VON HERKOMER Autograph Letter Signed. German born, naturalised British painter, composer and pioneering film maker. ALS. 1p plus integral blank leaf. Bushey, Herts. March 13th 1894. To. W[illiam] Woodall. "April 6th or 7th would suit me for your very kind invitation if convenient to yourself. I had a long talk with your Hanley School of Art Master on Sunday. I am now just writing the lecture upon this technical subject . . ."
8vo. Approx 7 x 4.5 inches. 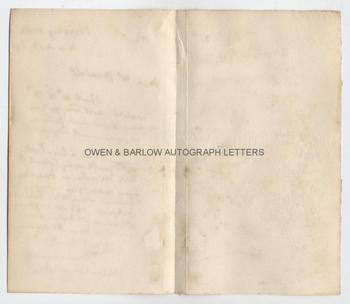 Old mounting residue and slight mounting damage to verso of integral blank leaf. Text leaf is in fine condition. Hubert Von Herkomer was one of the leading Victorian painters in Britain of portraits, figure subjects and landscapes. In addition he was an accomplished musical composer and a pioneer of the early cinematograph. He often put on performances of his musical compositions and films at his huge house, Lululaund, in Bushey, Hertfordshire. It was here that he also established the Herkomer Art School. Hubert Von Herkomer was a victim of the deteriorating relationship between Britain and Germany prior to the First World War and, from then on, was never really accepted by the British establishment. He died in Devon in 1914. William Woodall was a Radical Liberal MP for Hanley and the Stoke-on-Trent potteries. He was a trustee of the Wedgewood Institute and the technical school and school of art that was established in Hanley. 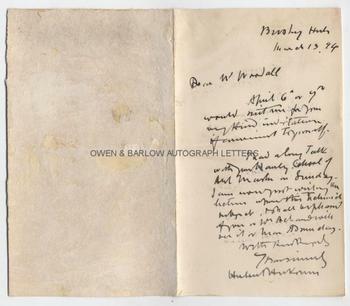 He often invited eminent artists, writers and others to address the students and Hubert Von Herkomer is evidently writing to William Woodall in this connection.